FARGO, ND –- Olympic gold medalist, Bart Conner, is scheduled to first make an appearance at the Freedom Elementary School in West Fargo at 8:45 a.m., Wednesday, September 25, and on Thursday, September 26, he will be the keynote speaker at the annual HipoCON Technology Show at the Hilton Garden Inn in Fargo, ND. Olympic gold medal gymnast, Bart Conner, speaking at Oklahoma Sports Hall of Fame induction. Conner plans to speak at the school about the Olympic values of achievement of excellence, honesty, integrity and respect for the diversity of others. He will be accompanied by staff from TNT Kids’ Fitness, Dakota Medical Foundation and the United Way of Cass and Clay Counties, which support the “Play, Move, Learn” program. In his keynote speech on Thursday, Conner will address an audience of about 175 information technology professionals from the region on business communications. 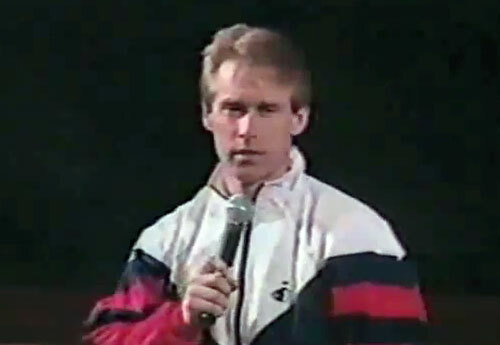 Conner was a member of three US Olympic teams (1976, 1980* and 1984), and won two golds at the 1984 Olympics. He is the only American gymnast, to have won gold medals at every level of competition, including international, national and collegiate. He currently owns and operates the Bart Conner Gymnastics Academy in Norman, Oklahoma along with his wife, Romanian gold medalist Nadia Comaneci. He is also a commentator for televised gymnastics events and an editor of International Gymnast magazine. Conner, who is active in many business ventures and charities, including the Muscular Dystrophy Association, travels the world delivering inspirational speeches and promoting gymnastics, fitness and healthy lifestyles. If you would like to book athletes like Bart Conner for a speaking engagement, personal appearance, endorsement, or corporate event, contact our booking agent for appearance and speaker fees or call 1.855.303.5450.